The Chancellor's Autumn Statement contained an apparent U-turn on the cuts to tax credits outlined in the July budget. 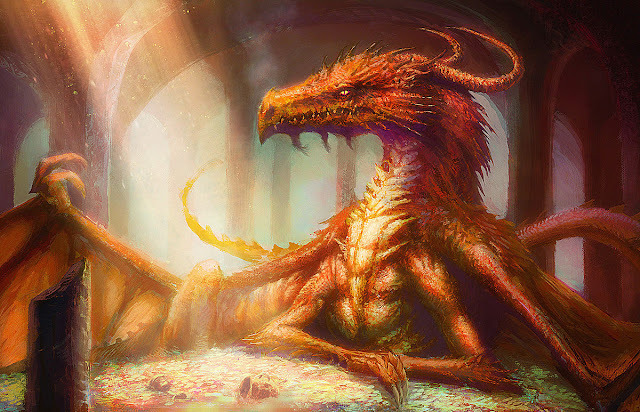 Predictably, this was presented as the Chancellor "listening" to those concerned about the impact of sudden large falls in income for working families at the bottom end of the income spectrum. The Conservatives continue to position themselves as the party for "hard-working families". The timetable for the rollout of UC is about as credible as the IMF's forecasts for the recovery of Greece. The latest revision shows a caseload below 6m in 2020-21. This is tiny. 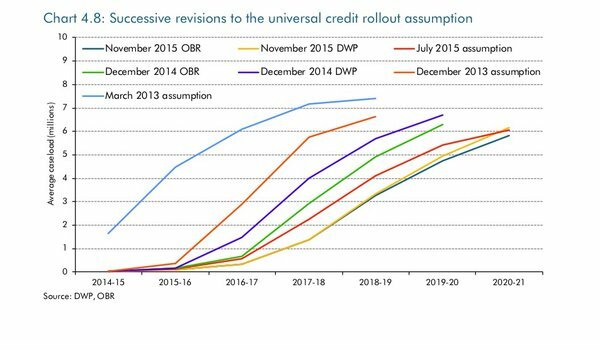 Our forecast of the marginal cost of universal credit is based on a new assumption for the pace of rollout, which we have once again deemed necessary to push back. 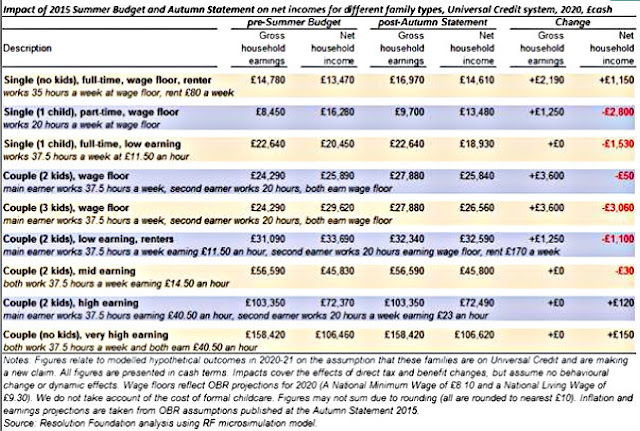 Correcting this means that the measures are now added into the forecast as though the legacy tax credit system continues indefinitely and only the marginal costs/savings are included in the UC forecast (line d). This results in a further fall in tax credit spending over the forecast period and an equal and offsetting increase to the marginal cost of UC. The net effect on spending is zero. 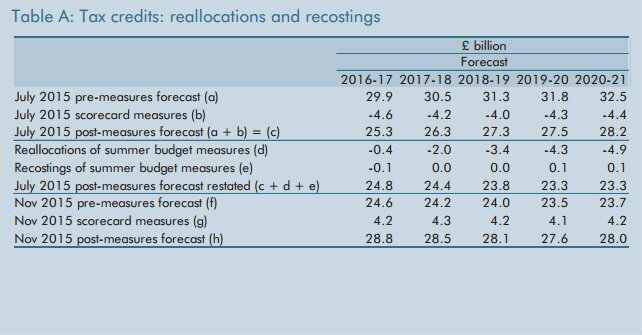 But irritating though the enforced methodological change must be for the OBR, the production of these tables highlights a much bigger problem for the Chancellor. 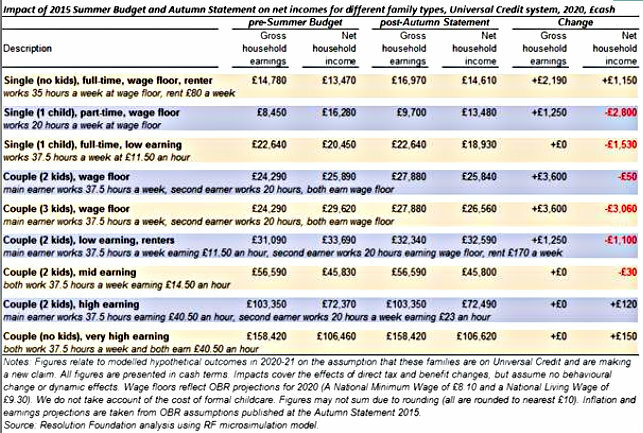 Even if the latest forecast for the UC roll-out timetable by some miracle proves accurate, these tables show that the tax credits change cannot be offset by the roll-out of UC. It just isn't being rolled out quickly enough. 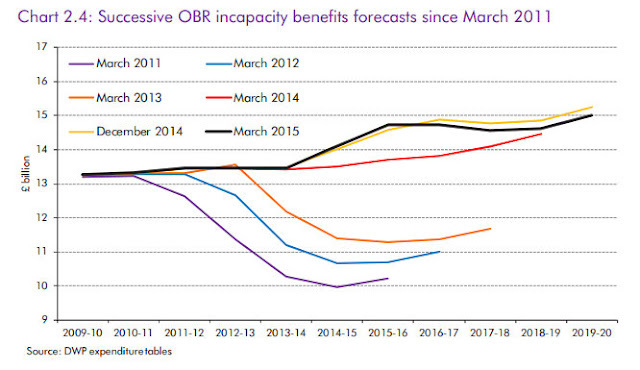 The Government’s policy decisions raise spending in the short term but reduce it by the end of the forecast. The near-term increase reflects the decision to reverse the main July Budget cuts to tax credits, which adds £3.4 billion to spending in 2016-17 alone. A variety of cuts to other benefits save increasing amounts over time and more than offsets the changes to tax credits by 2019-20. What benefits would these be, then? It is a concern to us that the revisions to our spending forecasts on DLA and PIP echo the pattern of revisions to our forecasts of spending on incapacity benefit and ESA during the reform of the incapacity benefits system. Not only did the reform of ESA/incapacity benefit fail to deliver the expected savings, the cost of the new scheme is actually quite a bit higher. It turned out that there were nowhere near as many "incapacity benefit scroungers" as was reported in the Daily Mail. This does not bode well for DSA migration. 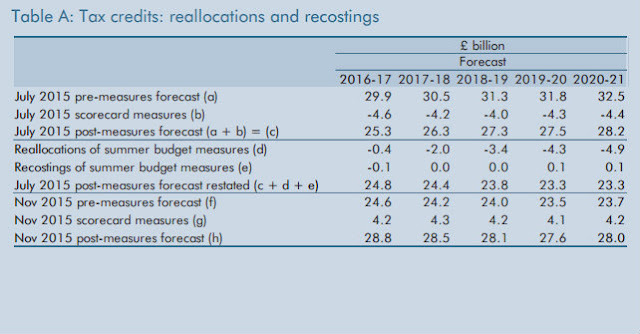 .....we have revised up our pre-measures forecast for spending subject to the welfare cap by increasing amounts from 2016-17 to 2020-21. The biggest change has been to disability benefits, including higher numbers of new claims to disability living allowance (DLA) and personal independence payment (PIP) and a slower pace of reassessments as cases are migrated from DLA to PIP. 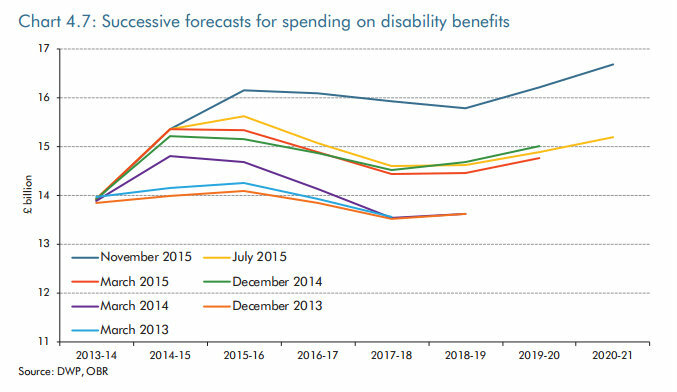 We have also revised up spending on incapacity benefits, assuming that 38 per cent of claims will be in the more expensive support group of employment and support allowance (ESA) in steady state (up from 30 per cent in our July forecast). New ONS population projections assume higher numbers of children, pushing up spending on tax credits and child benefit. Brilliant. 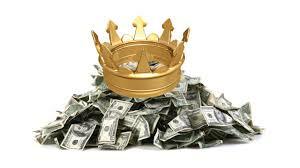 The new apprenticeship levy will keep a lid on earnings, thus reducing the triple lock on pensions as well as raising additional tax that might pay for those welfare spending overruns. And if all else fails, kill the old. Hi Jenny, no I haven't as yet, but I really should. Very high house prices/rents coupled with housing benefit would inevitably destroy the incentive to work. always nice to see people piling in on ids and the DWP, but the obr has given itself huge credibility problems in digging Osborne out of a hole. Depressing to note that the lack of savings anticipated from PIP (as opposed to DLA [children], AA) is due to slow rollout rather than a higher than expected rate of claim success. Astonishing to see the flimsy basis for the PIP projections - the cohort on which they are based will have very different characteristics to the general DLA population due to under go reassessement for PIP. Surprised that you suggest 6 million on universal credit is 'tiny'. It's certainly tardy (and of course it's entirely possible that there may be further delays), but six million is the vast preponderance of the expected total number of claims - and most of the remainder would not be working, as the plan is to transfer ESA claimants last.